Founded in 2009, AMUEBLA is a Group of stakeholders working together to address needs in the furniture and habitat sector, representing the interests of important furniture firms from the Mediterranean area. It is a non-profit association, characterized as a combination of companies, research and training centres, public and private, involved in collaborative exchange processes, aimed at obtaining advantages and benefits derived from the execution of innovative projects. AMUEBLA is considered the furniture industry and related sectors Cluster of Murcia Region. It is registered in the European Cluster Collaboration Platform and has got the Bronze Cluster Certification. The purpose of AMUEBLA is facilitated innovative practices to improve the competitiveness of partners companies, to defend its general business interests, and promote its projection and international visibility. It is a structured and interrelated industrial sub-sector. That it ensures their competitiveness and visibility in the market. AMUEBLA has more than 80 companies, with 2500 employees. 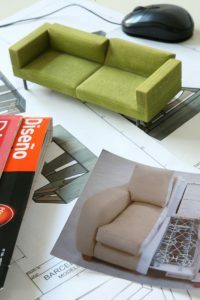 The associated companies belong mainly to upholstery subsector. AMUEBLA represents the interests of important furniture firms from the Mediterranean area, the partnership also involves two. Higher Education entities (University of Murcia and Technical University of Cartagena), the Technical Research Centre of Furniture and Wood of the Region of Murcia (CETEM) and public bodies (Murcia´s Regional Development Agency and Regional Association of Woodworking Entrepreneurs). The main activities are based on the promotion of joint actions between the companies and the establishment of convergent and common strategies in ambiences of innovation, environmental management, and training activities, among others. The involvement of this Cluster in this Strategic Partnership is directly linked with AMUEBLA´s 2014-2017 Strategic Plan, which is focused on the training and skills needs of the sector, together with the internationalisation of their members and the cluster itself, new business channels, product innovation and alternative management strategies. AMUEBLA is member of platforms related with the habitat and construction sector such as the Forest-Based Sector Technology Platform or the ESCP European Strategic Cluster Partnership on Sustainable Construction (CROSSCUT).